Step 1-Soak the saffron in one tablespoon of warm water and set aside. Step 2- Heat a non-stick pan. Add the khoya, sugar and glucose, and cook for fifteen minutes, or till the khoya leaves the sides of the pan. Remove from the heat and divide into four portions. Step 3- Add the cashew nuts to one portion, almonds to the second portion, pistachios to the third portion and saffron to the fourth. Mix each portion well. Step 4- Grease a 2-inch deep, six-inch square aluminium tray with a little ghee. 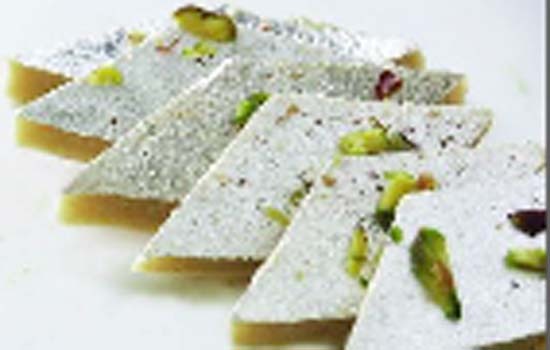 Divide each portion of burfi again into three portions and shape each one into a cylinder. Step 6- Repeat with a layer of the burfi in the order of the first layer. Step 7- Gently tap the tray on the tabletop and leave to set.